Top Family Law Attorney for Relocation Custody Cases in Orange County explains: Child custody can be complex, depending on the relationship between the parents and the child’s needs. One of the factors that can play a role in determining the terms of a child custody order is where the parents live. When two parents live far apart during the creation of a child custody order, one parent is likely to be granted sole custody, and the other will have the right to visitation. Ideally, joint custody will be granted while two parents live close together. However, when one parent needs to move far away, how does that affect the existing custody order? As a child grows older, his or her needs will change as life changes, and child custody orders are intended to be modified as a child needs it. So, what happens when a parent needs the custody order to be modified? There are several other reasons why a parent may need to relocate, but each situation will need to be evaluated by a judge. If you have questions about your specific custody case, you should discuss your options with a lawyer. Your custody attorney will be able to guide you toward making the best decisions to get the results that are best for you and your child. What If We Have Joint Custody and One Parent Needs to Move Away? "In order for a joint custody arrangement to work, both parents need to live relatively close to each other"
When two parents share joint custody of a child, it means that the court determined that it was in the best interest of the child to spend nearly equal amounts of time with both parents and to live with both parents. In order for a joint custody arrangement to work, both parents need to live relatively close to each other. If one parent needs to relocate and lives farther away than a joint custody agreement could handle, the custody agreement will need to be modified so that it works with the parents’ situation. With a joint custody agreement, both parents start on even ground. In order to move away with your child, you will need to prove that it is in the child’s best interest to relocate with you. Likewise, if you are the parent who is staying where you are and the other parent is trying to move away with your child, you will need to show the court that it is in the best interest of the child to remain with you. 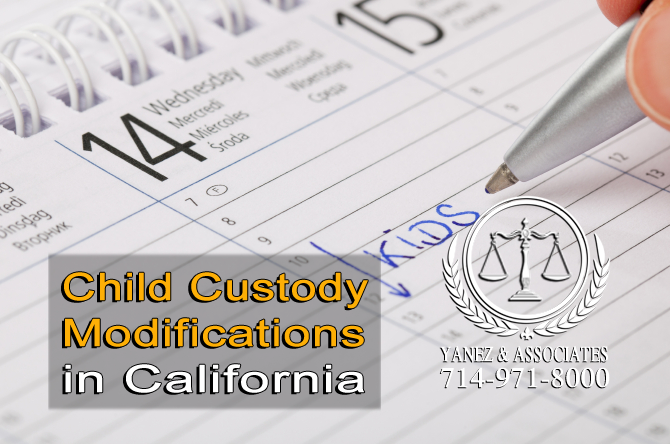 Modifying a child custody order in this case is similar to modifying it for any other reason. When the circumstances surrounding child custody change, you need to show the court that you are able and willing to put the child’s best interests ahead of your own—and you have the ability to show that you have been prioritizing the child’s needs previously. What If I Have Sole Custody and One Parent Needs to Relocate? "I Have Sole Custody and my ex-spouse Needs to Relocate? What Now!" If you have sole custody of your child, you may be going into your custody battle with the upper hand, depending on the relationship that the child has with his or her other parent. If you wish to move away with your child, you will still need to show that moving with you is more in line with the child’s best interests than remaining behind with the (currently) noncustodial parent. Remember that the potential exists for the other parent to become the custodial parent if the court determines that it is not in the best interest of the child to move away with you. • Your reason for moving will need to be considered. Are you moving because you want to take your child away from his or her other parent? If this is the case, or if the other parent can show that this may be the case, it is unlikely that custody will be granted. • Have you given notice to the other parent that you wish to move? While the law generally requires that you provide 45 days notice, it will help your case to provide the other party with as much notice as possible. Remember, custody is about the child’s best interest, not about yours. • Have you considered the child’s relationship with his or her other parent? It may help you to provide a potential custody or visitation plan that includes the other parent as much as possible. It goes a long way to show the judge that you will put your child’s needs first by considering the other parent, even if you and the other parent do not get along. • Have you discussed your case with an attorney? It may be best to file your own case with the court before the other party makes a move. If you have any questions about how to do this, you should always contact a child custody lawyer in Southern California. If you have sole custody and your child’s other parent wishes to relocate, that parent may initiate a case to modify the custody agreement as well. 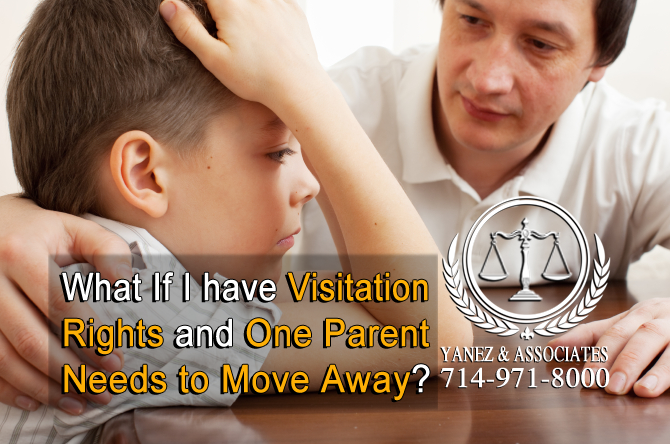 What If I have Visitation Rights and One Parent Needs to Move Away? "I have Visitation Rights and the other Parent Needs to Move Away? What do I need to know to preserve my rights?" If you have visitation rights, it usually means that your child’s other parent is the custodial parent. In this case, you may be entering your relocation case with a slight disadvantage. You should apply to have your custody agreement modified with the help of an attorney, even if it only means that your visitation rights will be modified to fit the new situation. The more time that you currently spend with your child, the greater your chances of successfully modifying the custody agreement how you wish for it to be modified. Like all custody modifications, you will need to show that your proposed custody agreement is in the best interest of the child. • Follow the terms of your existing custody order to a tee. Show up early for all exchanges with the other parent, be flexible if the opportunity to spend additional time with your child arises, and never speak negatively about the child’s other parent. • It is usually in your best interest to file a motion with the court before the other parent files. If you are not sure how to do it, you should contact a child custody attorney as soon as possible—the sooner you file, the more likely you are to sway the judge. • Usually, custody agreements that are made between the parents or outside of the courtroom are more effective and lead to happier families than when the judge makes decisions for you. If you can come to a custody agreement with the other parent outside of court, it may be worth an attempt. • Other factors that may contribute to the child’s life, depending on each child’s family situation. If you are relocating, or if you are facing the relocation of your child’s other parent, you should always contact an attorney to discuss potential changes to your child custody agreement. There may be things that you can do that will increase the likelihood of maintaining or obtaining custody of your child, whether you are relocating or staying put. If you have questions, contact the attorneys at Yanez & Associates as soon as possible. We offer free initial consultations, so contact us today to schedule yours! 2 What If We Have Joint Custody and One Parent Needs to Move Away? 3 What If I Have Sole Custody and One Parent Needs to Relocate? 4 What If I have Visitation Rights and One Parent Needs to Move Away? Can I Move With Our Children After a Divorce in OC California, Child Custody Modifications in California, How Do I Win a Child Custody Move Away Case in Orange County, OC California Child Custody Laws, Orange County Move Away & Relocation Lawyer for Child Custody, Orange County Parent Relocation Lawyers, Orange County Relocation and Child Custody Attorney, Parental Relocation in OC California, Relocation Custody Cases in Orange County California, What If I Have Sole Custody and One Parent Needs to Relocate?, What If I have Visitation Rights and One Parent Needs to Move Away?, What If We Have Joint Custody and One Parent Needs to Move Away? 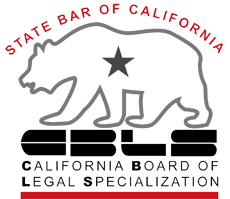 What is a Shared Custody Arrangement in California and How Does it Work?